Which Harold's Chicken Shack takes the prize? It might as well be written in the Constitution somewhere that Americans prefer their poultry pulled from the deep fryer. In my Texas hometown, for instance, fried chicken shares the same sacred pedestal as a fair trial. It’s served to city jail inmates as their final meal before they’re hauled off to county. Here in Chicago, we can be equally as fanatical, although in our own unique way. In 2013, the Chicago Eater asked food critics to describe the year’s food scene in one word. Three of the critics who were asked cheated and wrote “friedchicken.” Telling. 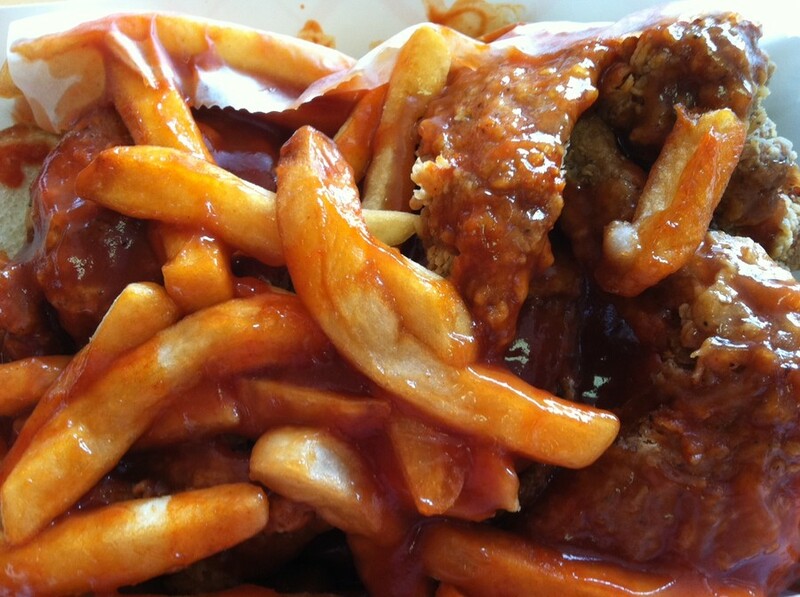 Of course, for us Hyde Parkers, our allegiance is to one only—Harold’s. No one can truly contest the influence of Harold’s Chicken Shack, Fish & Pizza. It’s an indelible community institution, the gravitational center of a good portion of 53rd Street, Kimbark Plaza, and really that entire corner of Hyde Park. Between Harold’s, Valois, and Medici, you’ve got the Hyde Park Holy Trinity—restaurants so deeply ingrained in the culture that you could probably write the history of the neighborhood with their stories alone. But for all the history, Harold’s also takes a good bit of flak for its services. There aren’t many students I know who truly dislike the Med or (God forbid) Valois. But Harold’s? Yeah, that’s no surprise and there are certainly a good number of dissenters—vegans and vegetarians notwithstanding. Where some find solace in the greasy bites of skin from a half-regular with s&p (salt and pepper, if you must ask) and mild sauce, others sense arteries gasping for life. Where some see drippings-topped bread bites and fries to soften the chicken’s blow, some taste a backing of cardboard. Supporters of the Kimbark Harold’s often point out that the food is only half the worth of Harold’s. Even die-hard Harold’s lovers have agreed with me that there is better-fried poultry. There’s just something to the heartiness and explosiveness of the chicken, die-hards say, not to mention the cheap and local run of it all. But to say that fried chicken can’t be simultaneously homey, greasy, and good is a fallacy not worth entertaining. Just take Harold’s Chicken Shack No. 2 as proof. To Harold’s aficionados, the Woodlawn location is nothing new. In fact, I’ve heard the arguments for and against the two spots before. One serves better food, the other is cheaper. It’s a personal preference, these die-hards would say. But what I experienced near the intersections of East 64th Street and South Cottage Grove Avenue was something quite different from the Harold’s I know. From the moment I called in my order at the Woodlawn location, things went better. Whereas the Kimbark Harold’s had almost notoriously grouchy service, this place took a complete one-eighty. The guy on the line asked for my name and my order, and then we held a real conversation. It lasted less than two minutes on the phone but he kept up with it once we got there. He made me and my friend feel included. He poked fun at us; he was thoughtful with the order. We walked home with our food, through the cold, and when we opened the bags the smells of the glorious fries exploded outward. I knew this was a different animal from the stuff at the Kimbark Harold’s. The pieces they gave out were larger, as was the bed of fries. There was less sauce, sure. But for some reason the ratios looked more harmonious than its competitor’s up north. And, holy Chicken King, was the taste divine! The meat was juicier and plumper. This wasn’t just fried skin anymore. This was fried chicken! I could still feel a movement in my arteries, but this time it was more of a flutter when matched with the warmth of the chicken meat settling in my belly. This was the fried chicken I knew and loved, just as good as in Texas, although standing unique. This isn’t to say that everyone should suddenly abandon the Kimbark location and head south to the glories of Woodlawn—although you might want to pay a visit—but it does mean there is still a good bit of learning that can be done. 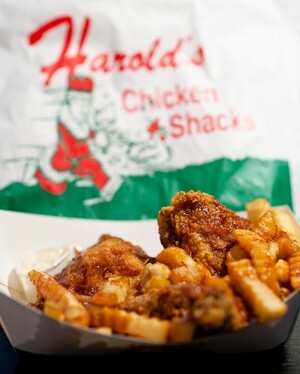 The Harold’s Chicken Shack franchise is notorious for its inconsistency. Each individual restaurant has different chicken suppliers, decides on different menu items (Kimbark is the only location to serve pizza), and even the amount of sauce thrown on is up to them. So with all that liberty, I gotta ask, what’s so bad about learning from your neighbor? Woodlawn Harold’s and Hyde Park Harold’s are allies in the same struggle, fighting to maintain the deadly delicious flavors that made them community hubs in the first place. As the Harold’s company makes the decision to standardize practices at new locations, it might be more important than ever that these older institutions one-up the competition and defend their neighborhood roots. Because at the end of the day, what better way to bring people together than a tray of wings at the table?